I was browsing through Pinterest and I ended up on the fashion tag. Naturally, I got inspired by a few dresses and today I'm sharing one of them. 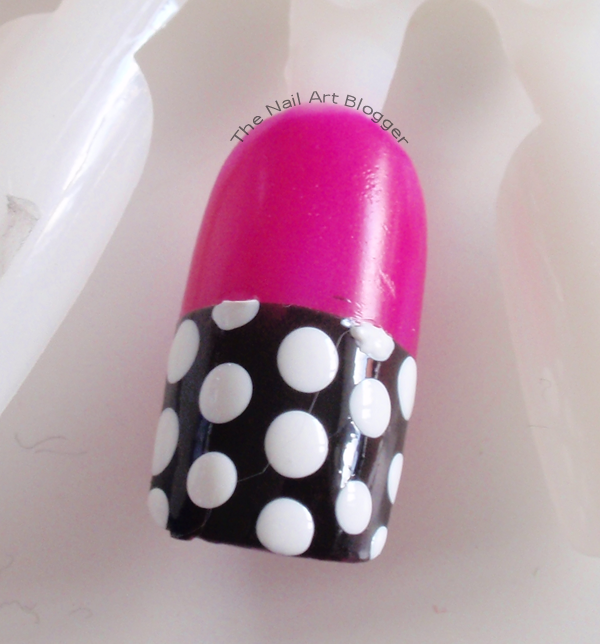 I used the nail wheel for this design because my nails are too short to have this design on (unless you want to do it with tiny dots, then it'll work). I started off by painting the nail hot pink (F1 by Digital Color Cream) and waited for it to dry. Then placed a striping tape in the middle (because I don't trust my ability to draw a straight line) and painted half of the nail black (144 black is back by Essence). I removed the tape immediately to prevent having it drag the polish off with it when it started drying. After the black was dry as well, I placed another striping tape at the same spot where it was earlier. That is so I could have a couple of dots look cut off. Added the big dots in white (101 snow me white by Sinful Colors), and waited for it to dry before adding a layer of top coat. Thanks for dropping by! Until next time!